Perhaps you have asked yourself what librarians do on their days off. Do we clean our eyeglasses? Practice making those tight buns in our hair? Catalog everything in our homes according to the Dewey Decimal System? This librarian spent her Friday off with ABBA. I went into the city for lunch and the movie version of Mamma Mia with my friend Maggie, and in the evening I met more friends for a Björn Again concert with Rockin’ the River Cruises. Both events were better than I could have imagined. Mamma Mia was absolutely ridiculous, and we loved every minute of it. Meryl Streep can do anything, and my Mr. Darcy crush on Colin Firth is fully renewed in flambouyant form. Even Pierce Brosnan, who is gifted in many ways but perhaps not in singing, was delightful. Maggie and I laughed harder than anyone else in the theater. I actually thought it was pretty empty until we got up to leave and saw all the stone faced audience members behind us. Those who love ABBA and can appreciate total camp were laughing out loud. Those who expected to see a finely crafted plot and no shiny purple leisure suits were kidding themselves. And Björn Again, well…they were everything I hoped they would be. 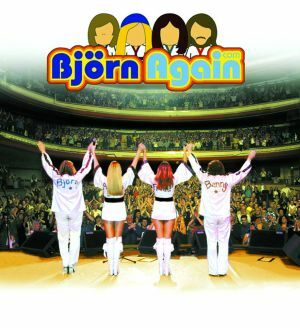 So much more than an ABBA tribute band, a legend in themselves, and the closest we will ever get to the real thing again. I’m sure the experience of dancing all night on a crowded, rocking boat is not the same as a real concert venue, but we had a fantastic time. Plus we saw the sunset, all the sites of the New York skyline, and the waterfalls installation. The best Girl’s Day Out I’ve had in some time. Next up: Madonnathon!